Women Entrepreneur Revolution - "So, I've been thinking..."
What Can YOU Learn From a Woman Entrepreneur? Why would I, a non-preneur, be interested in reviewing a book about women entrepreneurs? I have not started my own business, I have no desire to be the head of a company I’ve built from the ground up, and I certainly have no desire to dress in business attire, well, if Iâ€™m being honest, ever again. None of that holds any appeal. That doesnâ€™t mean I donâ€™t have any dreams or aspirations though, I would love to do something creative with writing and photography maybe. Maybe. Iâ€™m not sure yet. So while I raise my children and work part-time, I blog and take photographs, take online courses and learn editing programs. For when I am ready. So Iâ€™m not exactly an entrepreneur but that doesnâ€™t preclude me from having the desire to someday make money doing what I love, nor does it preclude me from wanting to be great at what I do. What, then, does Women Entrepreneur Revolution: Ready! Set! Launch!Â have to do with my indecision? I received a complimentary copy of this book to aid in my review. If you are an entrepreneur this book is most definitely for you. You will get advice on defining and choosing appropriate role models; identifying successful behaviors; managing fear and self-doubt; and becoming a role model for others wanting to follow in your footsteps. If you are not an entrepreneur but have any desire to work for yourself, do something you love to make money, or simply design a life you loveâ€¦this book is for you. You will get advice on defining and choosing appropriate role models; identifying successful behaviors; managing fear and self-doubt; and becoming a role model for others wanting to follow in your footsteps. Do you see what I did there? Being successful in business, especially as an entrepreneur, depends a lot on your success in life. The same general skills are needed for both â€“ and Jenn Aubert has identified some basic, yet often elusive, considerations for any woman interested in taking the journey to become better. Included with her findings are real-life stories. Women who have wanted more from their lives and faced their fear and self-doubt, defined their â€œwhy,â€ put one foot in front of the other and kept working towards achieving their dreams. If you check out the last section of the book, it is full of quotes and inspiration from the women interviewed by Jenn. Iâ€™m warning you now, after reading section oneâ€¦every time you see Oprahâ€™s name, youâ€™ll probably laugh. This book is different from other entrepreneur-inspired books youâ€™ll read because Jenn, an avid reader of â€œbusiness lit,â€ realized women were sorely underrepresented in the genre. So she took a year to research this book and fix that. This is a book for women entrepreneurs. Itâ€™s about a revolution. 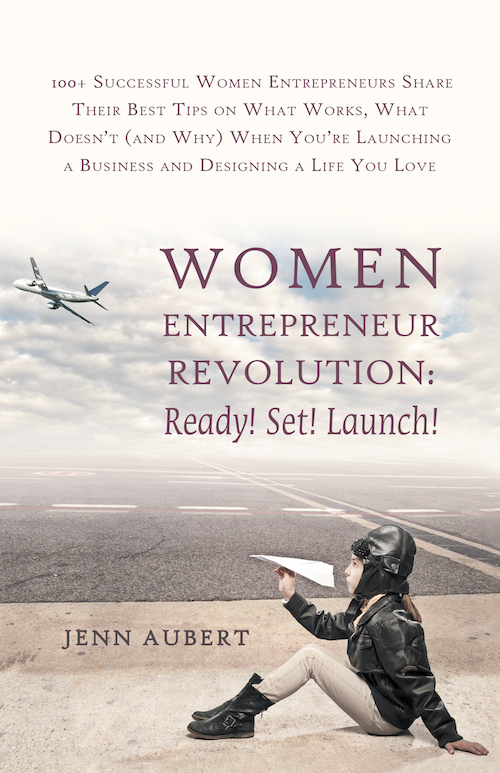 Disclaimer: I was offered the opportunity to review Women Entrepreneur Revolution: Ready! Set! Launch! by Crystal Ponti of Blue Lobster Book Co. I received a complimentary copy of the book in return for an honest review. All opinions are my own. Links to the book are affiliate links. Stephanie – great review from both perspectives; entrepreneur and non-entrepreneur. I would love to read this book! Thanks Tara – it’s an interesting read and I found myself flipping between personal and professional applications the whole way through. I love this! So happy you enjoyed it. That’s a great point! I loved the book…my take on it is coming next week! Looking forward to it Michelle, you are definitely an entrepreneur in my book…I can’t wait to see what you think. Thank you Stephanie for the great perspective and the lovely review! So much of ourselves are intertwined with our work – if it’s an empire or a blog, if you have 10k employees or 1k followers, if you do it solely to express your ideas/passions or to change the world. It boils down to the person. And, if our beliefs are all screwy and limiting, we won’t step fully into what’s possible – we won’t shine as brightly as we could. We’re living in a really cool time in history. There are so many options available these days to do what we love and make money (at home or out) either full time or part time for our efforts. We just have to make sure we get out of our own in order to soar. I feel sure that I could benefit a lot from that book – I don’t consider myself an entrepreneur but since we own a business now and I do pretty much all the work without having a clue what I’m doing….. Thanks for sharing this book. My hubby and I have a small business, so I guess we’re entrepreneurs, although it doesn’t feel like it most days. I will definitely be checking this out! I want to laugh when I hear Oprah’s name! I think I’m in. I think I might be an entrepreneur..or one in training. Sounds like a great book…regardless of how entrepreneur-y one may be! I’m always asked when I want to go back to work… and I honestly don’t know what I want to do when that day comes. Maybe this book will help me figure it out…. I need to get my entrepreneurial spirit back. In grade school I used to make cinnamon toothpicks and sell them to all the kids. I remember the feeling of quarter after quarter pilling up in my pocket and the feeling of cinnamon burning my tongue because I’d used too much. . Thank you again Steph for such a great write up and graciously hosting Jenn. Glad you liked the book!